In mathematics, the directional derivative of a multivariate differentiable function along a given vector v at a given point x intuitively represents the instantaneous rate of change of the function, moving through x with a velocity specified by v. It therefore generalizes the notion of a partial derivative, in which the rate of change is taken along one of the curvilinear coordinate curves, all other coordinates being constant. The directional derivative is a special case of the Gateaux derivative. in orange. 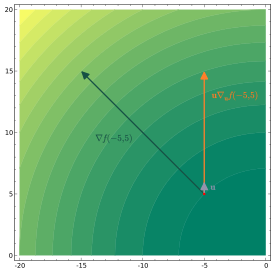 The gradient vector is longer because the gradient points in the direction of greatest rate of increase of a function. This definition is valid in a broad range of contexts, for example where the norm of a vector (and hence a unit vector) is undefined. Intuitively, the directional derivative of f at a point x represents the rate of change of f, in the direction of v with respect to time, when moving past x. The angle α between the tangent A and the horizontal will be maximum if the cutting plane contains the direction of the gradient A. In a Euclidean space, some authors define the directional derivative to be with respect to an arbitrary nonzero vector v after normalization, thus being independent of its magnitude and depending only on its direction. In the context of a function on a Euclidean space, some texts restrict the vector v to being a unit vector. With this restriction, both the above definitions are equivalent. This definition can be proven independent of the choice of γ, provided γ is selected in the prescribed manner so that γ′(0) = v.
where R is the Riemann curvature tensor and the sign depends on the sign convention of the author. Several important results in continuum mechanics require the derivatives of vectors with respect to vectors and of tensors with respect to vectors and tensors. The directional directive provides a systematic way of finding these derivatives. The definitions of directional derivatives for various situations are given below. It is assumed that the functions are sufficiently smooth that derivatives can be taken. ^ R. Wrede; M.R. Spiegel (2010). Advanced Calculus (3rd ed.). Schaum's Outline Series. ISBN 978-0-07-162366-7. ^ The applicability extends to functions over spaces without a metric and to differentiable manifolds, such as in general relativity. ^ If the dot product is undefined, the gradient is also undefined; however, for differentiable f, the directional derivative is still defined, and a similar relation exists with the exterior derivative. ^ Thomas, George B. Jr.; and Finney, Ross L. (1979) Calculus and Analytic Geometry, Addison-Wesley Publ. Co., fifth edition, p. 593. ^ This typically assumes a Euclidean space – for example, a function of several variables typically has no definition of the magnitude of a vector, and hence of a unit vector. ^ Hughes-Hallet, Deborah; McCallum, William G.; Gleason, Andrew M. (2012-01-01). Calculus : Single and multivariable. John wiley. p. 780. ISBN 9780470888612. OCLC 828768012. ^ Zee, A. (2013). Einstein gravity in a nutshell. Princeton: Princeton University Press. p. 341. ISBN 9780691145587. ^ Weinberg, Steven (1999). The quantum theory of fields (Reprinted (with corr.). ed.). Cambridge [u.a. ]: Cambridge Univ. Press. ISBN 9780521550017. ^ Zee, A. (2013). Einstein gravity in a nutshell. Princeton: Princeton University Press. ISBN 9780691145587. ^ Mexico, Kevin Cahill, University of New (2013). Physical mathematics (Repr. ed.). Cambridge: Cambridge University Press. ISBN 978-1107005211. ^ Edwards, Ron Larson, Robert, Bruce H. (2010). Calculus of a single variable (9th ed.). Belmont: Brooks/Cole. ISBN 9780547209982. ^ Shankar, R. (1994). Principles of quantum mechanics (2nd ed.). New York: Kluwer Academic / Plenum. p. 318. ISBN 9780306447907. ^ J. E. Marsden and T. J. R. Hughes, 2000, Mathematical Foundations of Elasticity, Dover. Hildebrand, F. B. (1976). Advanced Calculus for Applications. Prentice Hall. ISBN 0-13-011189-9. K.F. Riley; M.P. Hobson; S.J. Bence (2010). Mathematical methods for physics and engineering. Cambridge University Press. ISBN 978-0-521-86153-3.